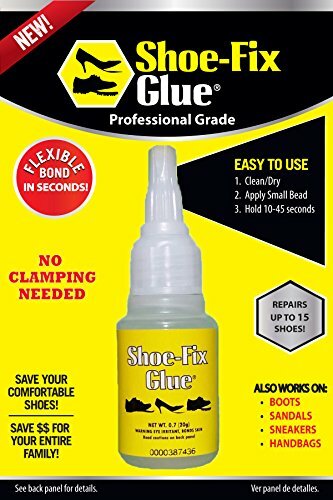 "Shoe-Fix's Shoe Glue is a flexible super glue that works almost instantly on footwear! As my dad used to say "If the shoe fits, Glue It!" Even the famous Gorilla Glue and Shoe Goo can't compare with Shoe-Fix Shoe Glue when it comes to re-attaching the soles and heels of your favorite boots, shoes, and sandals. The flexible super glue formula was specially created just for repairing footwear. Whether it's in the blistering summer heat or icy cold of winter, Shoe-Fix Glue is designed to hold. Most super glues dry rigidly and can take several minutes or more to fully cure. Shoe-Fix Glue dries clear and flexible! Whether you need to glue your shoes for a hard day's work, a tough day of training, or just a walking around the office, Shoe-Fix Glue can repair your dress shoes, athletic sneakers, and your work boots." - John Hnilica, Founder NJOY Distributors, LLC. Shoe Glue that bonds almost instantly with no clamping! Doesn't expand or dry thick like the other leading brands. It's what the professionals use. We know, because we've been doing shoe repair for three generations! Re-attach your sole with confidence because unlike other shoe glues, Shoe-Fix's shoe glue creates a flexible bond unaffected by heat, cold or moisture. Dries clear, so you can use it on any color shoe with out worrying about black smudges or discoloring your fingers when using it. Safe to use on all rubber and vinyl footwear including dress shoes, athletic shoes, climbing shoes, boots, sandels, and more. Specifically formulated to create a lasting bond that stays strong so you can have confidence in repairing your shoes yourself. If you have any questions about this product by Shoe-Fix, contact us by completing and submitting the form below. If you are looking for a specif part number, please include it with your message. Survival Sewing Kit This sewing kit can ensure that whatever you need sewn will stay fixed. It features 2 spools of 80 lb test Kevlar sewing line, each containing 75 feet of braided line.